String lights, also known as Christmas lights and/or rope lights, are multiple lights that are usually smaller than standard-sized light bulbs that hang off of a cable/string/wire. 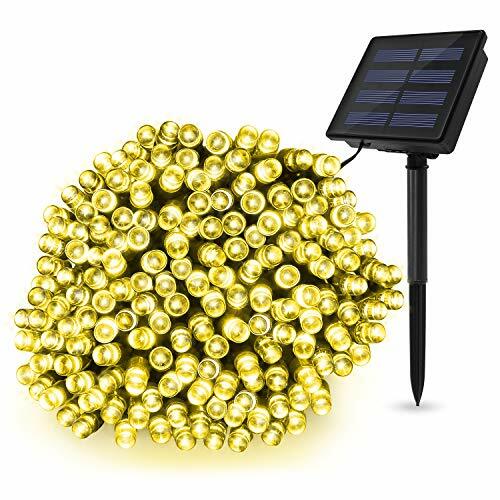 Solar string lights are portable string lights that are connected to and powered by a small solar panel, usually the size of a palm. Non-solar string lights are usually plugged into a power outlet, but some are even powered by a battery pack. Why go solar and what makes these great? Non-solar string lights can add to the electricity bill every year or cost more because of the batteries that they require. 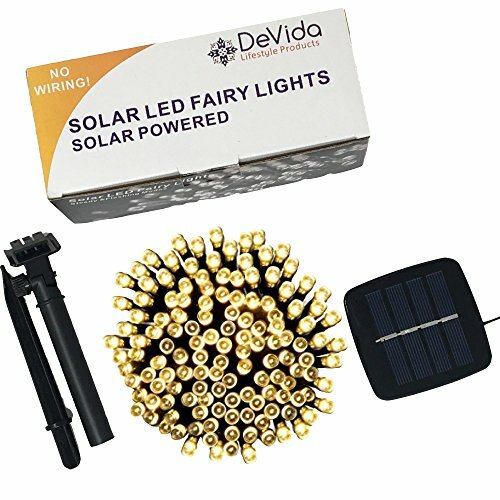 Solar string lights are powered by natural sunlight, leading to no extra cost after initially buying the string lights. 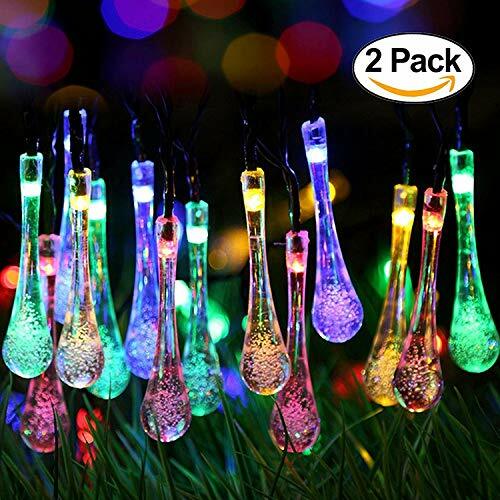 Most solar string lights use LED light bulbs instead of incandescent light bulbs. LED light bulbs emit less heat and use less energy to be powered, which also makes them last much longer than incandescent light bulbs. Length: Most string lights are over 2 dozen feet long. The bigger the project, the longer the lights should be. The smallest lengths are around 20 feet while the longest lengths are 200 feet or more. Number of lights: The number of bulbs are usually proportional to the size. A 20-foot strand has between a dozen to 40 lights while a 100-foot strand can have around several hundred lights. Time it takes to fully charge: String lights that take less time are usually better for those who live in somewhat cloudy areas. Although, those with shorter charge times also stay lit up shorter as well. How long a full charge lasts: Most light usually last 6 or more hours, but there are a few that can last shorter than that. The longer the full charge lasts, the extra time the lights will have when it is cloudy next. Light temperature: The temperature can mean the difference between a warm atmosphere and a cool, bright area. If the lights are being used for aesthetics, look for warm ones. If they are being used for lighting up places or standing out, use cool ones. 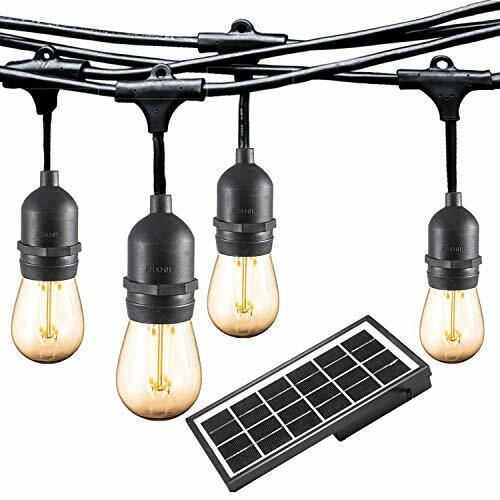 Standout features: Most of the solar string lights come with ground stakes, but these lights come with a ground stake and a clip to be able to attach the solar panel to a wall, fence, or something else off of the ground, making it great for indoor or outdoor use. The bulbs and wiring are also weatherproof, being able to withstand temperature shifts, rain, wind, and damp climates. The bulbs themselves also stay cool to the touch after several hours because they are LEDs. Standout features: These lights can be charged with the solar panel, but the battery can be changed as well. When the battery is dead from a cloudy day, switching the battery with a fully charged one will keep the lights on for another 8 to 10 hours. They can be used both indoors and outdoors because of them being waterproof, not to be confused with weatherproof. These lights are also a 2 pack, meaning there are 2 20 foot light strands. 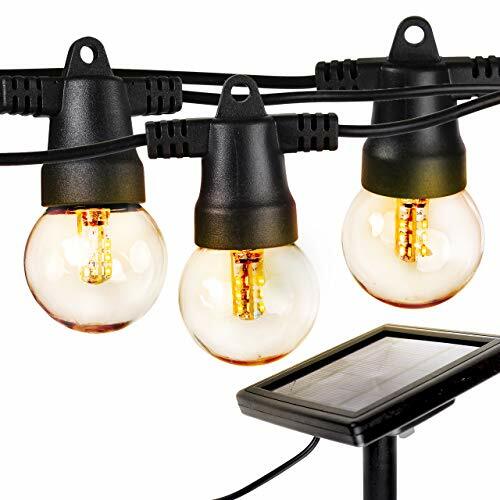 Standout features: Unlike other chords that are covered with plastic or rubber to protect the wiring, these lights have exposed and bendable copper wiring than blend with the bright, warm LED lights to create a natural glow. These lights also come in a 2 pack which can be used both indoors and outdoors, due to them being waterproof. Although, it is recommended to keep them coiled neatly when not in use to prevent damage. Standout features: Each of these crystal globes LEDs are decorated with a silver Moroccan design that stands out in the day when they are not on. 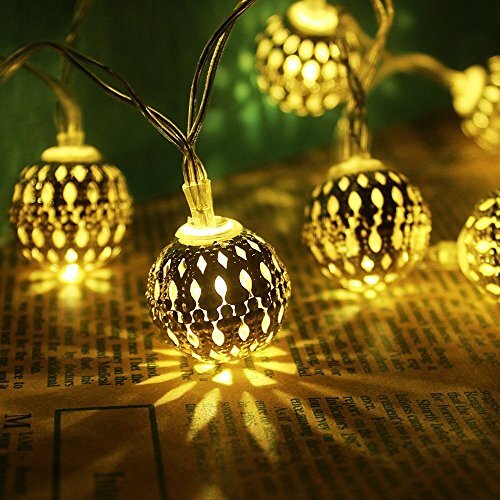 They are also waterproof and prevent against extra moisture from getting inside the bulb, which would ruin them, making them perfect for outdoor use. With the LED bulbs, they stay cool to the touch so they can be used inside as well. Standout features: Being weatherproof, these lights can remain outside all throughout the long summer and winter months. With the cool temperature LED light design, they can also remain inside all year round as well. These lights come in a 2 pack as well, raising the already high amount of lights to 400 and the length to 144 feet. The lights are able to last around 10,000 hours long, which is over 400 consecutive hours. Standout features: These LED lights, unlike most of the other smaller ones that have a white light temperature, have a warm white temperature. 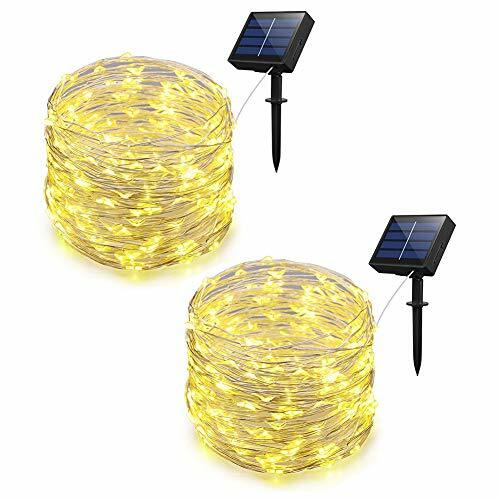 Like the previous light strands, they also come in a 2 pack, can be used all year round both indoors and outdoors, come with detachable ground stakes, and are weatherproof and waterproof. Standout features: Like other products, this solar panel can be detached to the ground stake that it comes with. What makes these lights different is that the ground stake that the solar panel sits on can be rotated at a 90-degree angle so that it can face the sun better. They can also be used all year round, inside or outside, and come in a variety of colors. 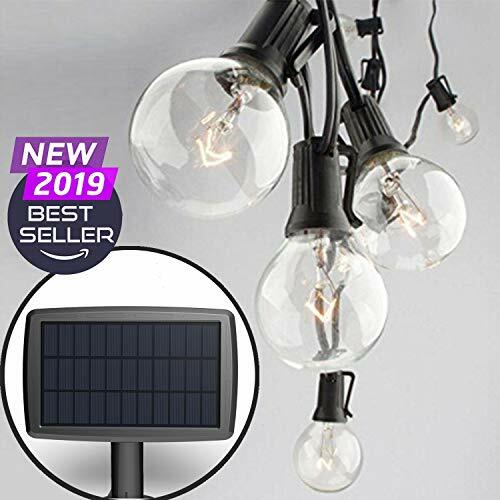 Standout features: This is one of the few light strands that has an adjustable solar panel ground steak to position it better towards the sun. With its extra long cord, the light strand is great for wrapping around trees without having to worry about the rain; they are waterproof. 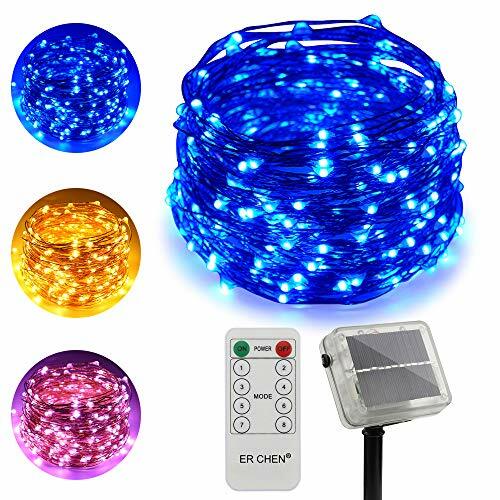 Standout features: Another solar light strand of lights that do not have plastic or rubber covering over the wires, these are very similar to the other product. The main differences are that they have silver wiring and not copper, they have more light settings, and they have a cool white temperature. 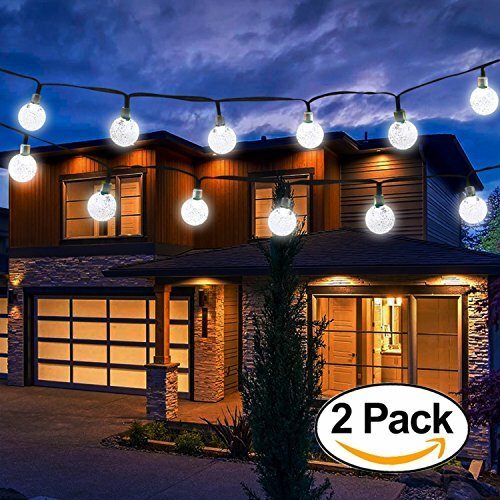 Standout features: With its PVC sockets and heavy-duty copper wiring and solar panel, these lights are designed to be completely waterproof and weatherproof, withstanding extreme temperatures, rain, wind, and damp climates. They can also be used indoors as well. Unlike the other LED Edison bulbs which are circular and globe-shaped, these LED Edison bulbs are antique-styled and have a warm light temperature.